Rick Perry, whose star in the Republican party has been falling of late, has released his... umm... tax plan. It's a flat income tax of 20% (individual and corporate), with a personal exemption of $12,500. That's the stupid part of the plan. Here's the nefarious part of Rick Perry's plan (and really, all the other Republicans' plans too): he would eliminate the Paris Hilton tax (aka the estate tax) and the capital gains tax. A year or so ago, I pointed out how the capital gains rate is essentially the rate of taxation for the uber rich, and how while we were bickering about the upper income tax bracket, the ultra wealthy were laughing all the way to the bank with their super low capital gains rates. Let me refresh your memory. Here is the percentage of their income the 400 richest tax filers pay in this country. 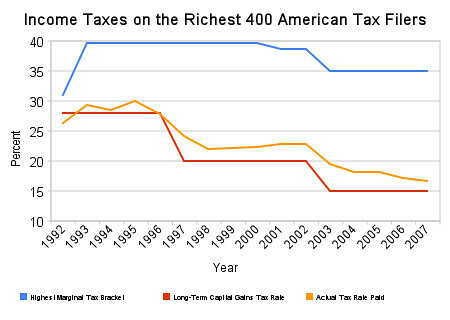 As you can see, the actual rate paid (orange line) by the wealthiest IS essentially the capital gains rate. Why? Because the wealthiest make money from money, not from work. Rick Perry wants to make that rate zero. That means that he wants to exempt the ultra rich from taxation altogether, therefore by definition shifting the burden of taxation to everyone that is not uber wealthy. Oh, and not only do they get to make all their money tax free, their trust fund babies get to inherit it tax-free, too, courtesy of Mr. Perry. What else is hidden in this? All the tax credits targeted for working families? Gone. No more earned income tax credit (hey, didn't you get the memo? Earned income is not nearly as good as capital gains income in Rick Perry's America). No more child tax credit. But hey, Perry says you can file under the old tax code if that's better for you. Great. So what he really wants to do is cap the income taxes for the affluent at 20% if you happen to make your money by working in a profession, and cap it to zero if you are part of a blue bloodline moneyed aristocracy. Yep, sounds just like the America our Founders envisioned. Just ignore all that "general welfare of the people" stuff in the Constitution. But what happens when you do it? What happens when you ensure the least amount possible is taken into the treasury for the common good of the American people? The common good suffers. With plummeting revenues (and Perry's proposed limit of 18% of GDP in spending), you can expect less public safety, more corporate power, a government incapable of defending its citizens against corporate abuse or (literal or figurative) highway robbery, broken schools for your children and private mansions for the heirs of ne'er-do-wells. Not only is the tax burden shifting hugely to the middle class and the economically disadvantaged, they get hit with a double whammy by having the most vital services cut - like social security, Medicare, unemployment insurance, student assistance and damn nearly everything. According to the NY Times, we are talking about a cut of one-third of the discretionary federal budget. One third. Unless Perry is thinking about getting rid of most of the Pentagon, and I don't think he is, Rick Perry is defining a war against the non-rich, in which the ultra rich is completely exempt from any responsibility in contributing to the future of this country, and everyone else gets it coming and going. If you are rich, you get a free pass. If you're poor or middle class, you get, umm... "exemptions" for borrowing from the rich (like the mortgage interest exemption, which Perry preserves). What Rick Perry and other Republicans seem to have a problem with is not a liberal vision of America - it is America itself. America believes is social responsibility and the public good. America was striven on the idea that individual opportunity is a hollow phrase without public investments in education, infrastructure and justice. America has always championed opportunity that was built on the shoulders of the previous generation (whom we now have a social responsibility to care for) on time borrowed from our children (to whom we have a social responsibility to care for). We pay for all of those things, as a country, by the means of taxes. And America has shined as the beacon of hope throughout the world on the idea that we build a shared, brighter future with shared resources, and that those who can afford to contribute more to those shared resources, ought to.